A point is located in a square. Distances are drawn to either the sides of the square or to its vertices. This applet provides an environment to explore under what circumstances the four distances can form a quadrilateral, and if they can, what can be said about the quadrilateral formed. Move the yellow point in the left panel to set the four distances. 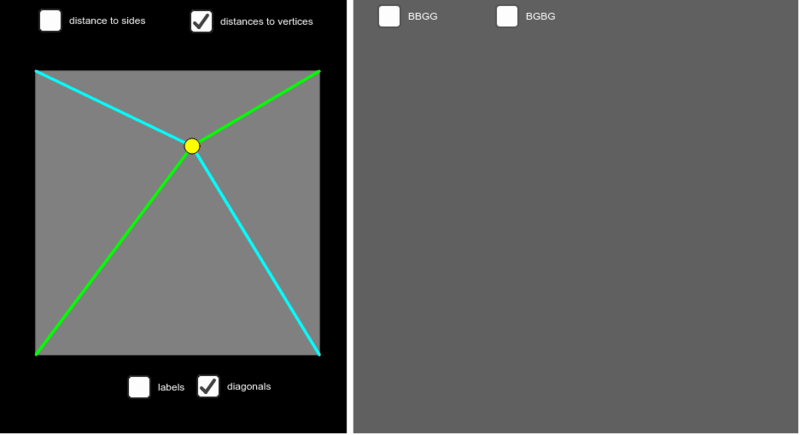 There are two ways to link the four distances to one another to form a quadrilateral – either BLUE - BLUE - GREEN - GREEN [BBGG] or BLUE - GREEN - BLUE - GREEN [BGBG] Having fixed the location of the point in the square in the left panel, start by choosing one of the kinds of linkages [ either BBGG or BGBG ] and drag the white and black dots to form closed quadrilaterals. The yellow dot allows you to translate the linkage without deforming it. What can you say about the kinds of quadrilaterals that you can form with each linkage of the distances to the sides? Are there quadrilaterals that can be formed with one linkage to the sides but not the other? Are there quadrilaterals that cannot be formed at all by either linkage to the sides? What can you say about the kinds of quadrilaterals that you can form with each linkage of the distances to the vertices? Are there quadrilaterals that can be formed with one linkage to the vertices but not the other? Are there quadrilaterals that cannot be formed at all by either linkage to the vertices? What questions could/would you ask your students based on this applet?